UFC 146: Dos Santos vs. Mir was an Ultimate Fighting Championship event held on May 26, 2012, at the MGM Grand Garden Arena in Las Vegas. For the first time in UFC history, all five fights on the main card were heavyweight bouts. 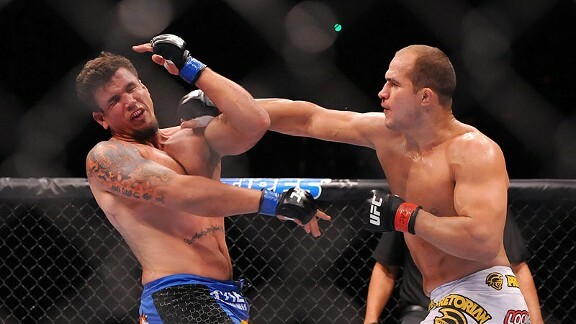 The main event was a heavyweight championship bout between reigning champion Junior dos Santos and challenger Frank Mir. Originally, dos Santos was scheduled to face Alistair Overeem, but on April 4, Overeem tested positive for elevated testosterone levels. He was removed from the fight card and Mir, who was originally scheduled to face Cain Velasquez in the co-featured bout, was promoted to the main event. Dos Santos defended his title, winning via TKO in the second round. Dos Santos drops Mir with a straight right and follows up with a series of strikes, forcing a stoppage at 3:04 of the second round. Dos Santos, making his first title defense, wins his 10th consecutive fight, including all nine since joining UFC. His overall record stands at 15-1, with 11 wins via knockout. Mir, a replacement for the suspended Alistair Overeem, falls to 16-6 overall, suffering his first loss since UFC 111. The former champion has been knocked out in all six of his career defeats. Fighting for the first time since losing his belt, Velasquez makes quick work of Silva, using an elbow to open up a bad cut and a ground-and-pound barrage to finish him off. Velasquez improves to 10-1 overall, with nine of his 10 victories coming via knockout. This is his fourth consecutive fight, including his los to dos Santos, that ended in the first round. Silva, the former EliteXC champion, was making his UFC debut. He falls to 16-4 overall, and has lost his last two fights. Velasquez will be fighting for the first time since losing his belt to dos Santos in November. Nine of his 10 career fights, including his only losses, ended in knockout. Silva, the former EliteXC champion, will be making his UFC debut. His last five bouts came under the Strikeforce promotion. Nelson, who came in having lost three of his previous four fights, scores a knockout 51 seconds into the first round, improving to 16-7 overall. It's his fastest win since knocking out Stefan Struve 39 seconds into their bout at UFC Fight Night 21. Nine of his 16 career wins have come via knockout. Nelson's UFC record now stands at 4-3. Herman, an injury replacement for Gabrial Gonzaga, loses his second consecutive fight to fall to 21-4 overall. This is the first time he's suffered a first-round defeat. A matchup of previously undefeated fighters sees Miocic improve to 9-0 overall while handing Del Rosario his first defeat in 12 career fights. Miocic has won seven of his nine career fights via knockout, including each of his last two. He's 3-0 since joining UFC. Del Rosario was making his UFC debut. The 6-foot-11 Struve, fighting on a pay-per-view card for the first time since UFC 130, earns his fifth win in his last six bouts. He improves to 23-5 overall, with 15 of his 23 wins via submission. 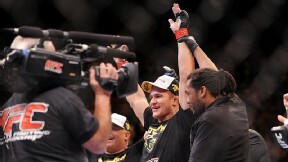 Johnson stepped in for an injured Mark Hunt and suffered his first UFC defeat in three fights. He's 17-5 overall.